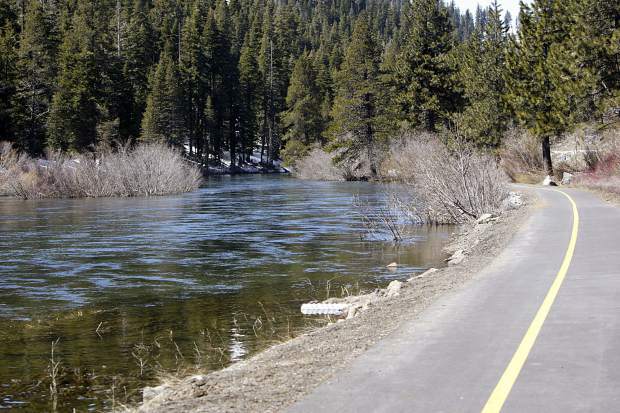 The multimedia presentation will play at night from 9 - 11 p.m. and tell the story of the threats to Lake Tahoe's environment. Keep Tahoe Blue is an iconic slogan that has been broadly recognized and embraced by the public worldwide for the past 50 years. Now in 2017, we are faced with taking the public dialogue around this long-standing call to action one step further, and that is to do our part in preventing Lake Tahoe from turning green. It is imperative that all of us become aware of how we can help protect the lake: once it turns green, we are told, it will stay green forever. And at the current rate, it could turn green before 2030. How to catch the attention of an often-preoccupied public? Art is one effective method. 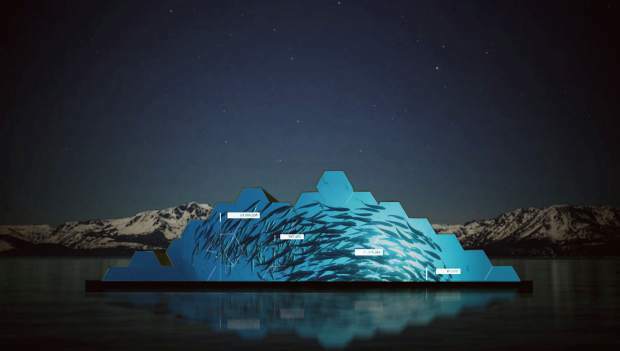 This August, Tahoe Public Art will be unveiling a temporary 20-day environmental art installation that will be floating on a 50-by-25-foot barge in Lake Tahoe. The three-dimensional sculptural work of art is designed to have a zero carbon footprint, utilizing renewable energy sources such as solar to power the installation, and each component of the installation is reusable or recyclable. The goal of this “public intervention” art piece is to attract, educate and activate audiences to learn about the science behind the impacts climate is having on Lake Tahoe and to engage locals and visitors alike in taking part in available solutions. Whether people accept climate change or not, we can’t deny that we all emit carbon dioxide. In fact, the average U.S. citizen emits more than 1 metric ton of CO2 per month. 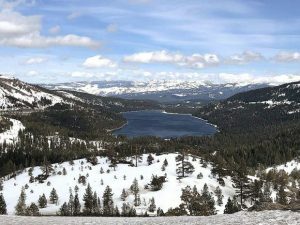 If global greenhouse-gas emissions (a vast majority being made up of CO2) continue at current levels, TERC states that the deep mixing of Tahoe’s lake layers could become less frequent and less deep — even stop altogether. “Once oxygen stops reaching the lower layers of the lake, phosphorus that is currently locked up in the lake-floor sediments will get released. This phosphorus will eventually reach the lake’s surface, where it will fuel algae growth,” stated Geoffrey Schladow, TERC director. We are not talking about 100 years from now, we are talking about this happening within the next 10 years. This should be alarming to all of those who love the pristine clarity and magical azure color of Lake Tahoe, and should be enough to herald people to come together to do something about it, individually and collectively. Our upcoming art installation, titled “LAKA’LELUP”, a Washoe (Wášiw) term meaning “coming together for a common purpose,” is designed to inform and activate audiences onsite and online about how we can come together individually and collectively to preserve and protect the natural grandeur of Lake Tahoe and the Lake Tahoe Basin. By day — in the “Reflect Mode” — the natural phenomena of da’aw — Lake Tahoe — such as water, weather and sunlight, bring life and light into play on the reflective facades of the ephemeral art installation, inviting people to paddle board or kayak out to it to actually see themselves in their local environment and contemplate their relationship to the Tahoe Basin. By night — in the “Illuminate Mode” — the installation transforms into an aesthetic multimedia experience with scientific data-driven storytelling, intertwining art, science and technology with an environmental call to action. Data sets from our scientific content collaborators include the latest reports available from TERC’s “State of the Lake” and the Tahoe Regional Planning Agency’s (TRPA) “Environmental Improvement Program” to drive the data visualizations. Audiences can log into the mobile companion website via their smartphones to access the audio components and musical score in real-time, do a deeper dive into the data sets, and register to make their personal pledges to reduce or offset their carbon footprint. We provide a carbon calculator tool to help people determine how much they need to offset their carbon footprint (approximately $10 per month to offset 1 metric ton of CO2) and we direct them to our carbon offset partners where they can make tax-deductible donations to tree-planting, solar plants, wind farms and other sustainable efforts to restore balance in our local ecosystem. With community-based participation at its center, LAKA’LELUP provides a public platform that strengthens the connection between people and their surrounding environment by creating awareness, stimulating dialogue and activating change that leads to long-term respect for coexisting with the natural ecosystem of the Lake Tahoe Basin. 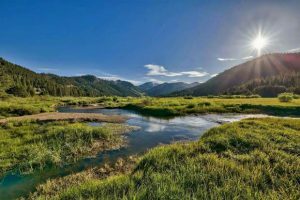 By sharing a set of values that guide behaviors to protect Lake Tahoe from the impacts of climate change, we instill a sense of responsibility in locals and visitors alike to ensure that the clarity and purity of this precious natural resource we experience today will be equally enjoyed by future generations. 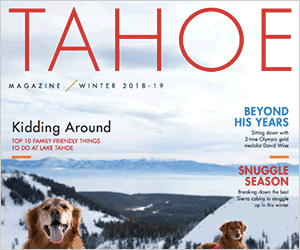 Tahoe Public Art is a 501(c)(3) nonprofit registered in California and Nevada, we rely on individual contributions, foundation grants and corporate sponsorships to brings projects like this to fruition. The LAKA’LELUP art installation is not funded by any tax dollars, however, tax-deductible donations can be made via our INDIEGOGO / Generosity Campaign (search http://www.generosity.com/community-fundraising/environmental-art-installation-on-lake-tahoe). LAKA’LELUP, timed to coincide with the Lake Tahoe Summit in August, will be exhibited on North Shore, near Commons Beach, from August 4-13 and on South Shore, near Ski Run Marina, from August 22-31. The multimedia experience will play after nightfall, approximately from 9-11 p.m. each night. For more information and updates, please visit: http://www.tahoepublicart.org and follow @TahoePublicArt and join the conversation on Facebook, Twitter and Instagram. For inquiries, please contact info@tahoepublicart.org or 530-580-8121. Mia Hanak is the executive director of Tahoe Public Art. Prior to joining TPA in November of 2016, over the past decade she has been producing large-scale public environmental art installations worldwide in partnership with the United Nations.